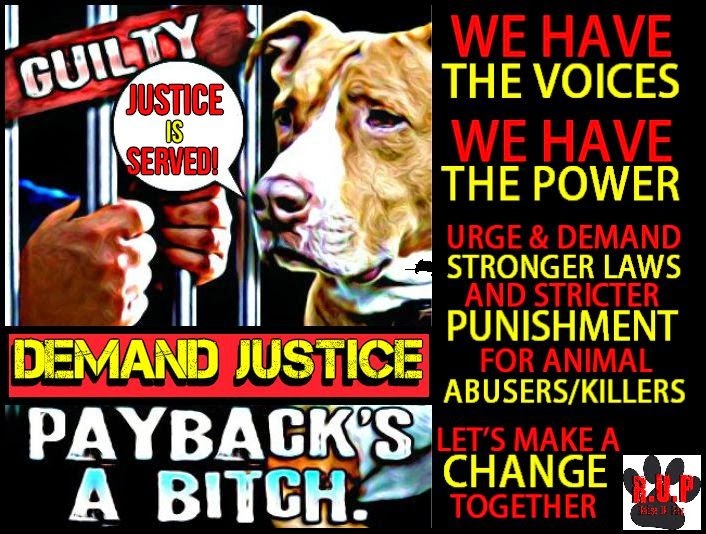 RAISE UR PAW NEWS: WHERE IS THE JUSTICE? standing up for stronger laws against animal abuse/cruelty. WHERE IS THE JUSTICE? standing up for stronger laws against animal abuse/cruelty. Animals are constantly being the targets of humanity's greed, abusive and cruel behavior, even enduring torture and pain due to experiments for humanity's vanity, the list goes on and on, even to the point where the legal system refuses to see the barbaric nature and create laws that are strong and punishable - laws that should be protecting and serving justice for innocent lives, instead of permitting offenders to walk away with mere slaps on the wrist. Although there has been many campaigns, petitions, world voices being raised to help save the lives of countless animals, it seems that many of these are either being ignored or set up on a shelf to collect dust - putting the issues on the back burner, and for what reason? Is it because animals cannot vote, or have a voice - that the theory that we humanity are the "superior species" and should not be held accountable for our actions against weaker species - is this the kind of world that we are living in, the kind of world we want to leave to our future generations? I feel the need to express my concerns because time and time again we are seeing these violations of animal welfare/rights which seem to be increasing more and more each day, witnessing the severity of the cruelty/abuse that these poor animals are being subjected too by those that I can only call "MONSTERS" and that the legal system is failing to produce suitable justice against these offenders --- letting the animals down, when we as humanity should be guardians for them. When do the innocent lives of animals become important enough to protect? when it is too late? when there are no more of these beautiful babies inhabiting the Earth? We must ask ourselves these questions, and come together to create a solution - to promote compassion and make this world a safer place, not only for humanity, but for innocent lives of animals as well - We should not have to beg and plead for something to be done - it should already be present, and yet here we stand urging our world and government to stand up and speak out for animal life. This is not only our world, but their world as well - they should not have to be considered second best, and have no justice - these are innocent lives that are being destroyed, abused, treated inhumanely and even butchered by those who were meant to protect them "humanity" - because of greed, vanity, human interest, barbaric behaviors and so much more - and yet it is the animals that suffer, and humanity walks away with minimal punishment for their crimes, permitted to victimize another animal or even a human life - the next step further. I am hoping that the Government and the world will come together as a unity and see to it that JUSTICE is served for animal life - to make stronger laws and stricter punishment - to create methods and strategies that will keep animals from enduring any more pain and suffering, or costing them their lives. We need to step away from the "SUPERIOR SPECIES" theory and create a "COMPASSIONATE SPECIES" - animals are here for their own reasons and purposes, not for us, and we need to realize that! Let's Stand Together and Make A Difference - Every Voice Counts. i will not hesitate to kill anyone who even dares to hurt, torcher or kill an innocent animal. i will stand up for innocent abused animals and punish their owners with the harshest punishment there is, or even death.